Located on the famous Kona Coast of the Big Island of Hawaii, the Royal Aloha Keauhou-Kona Surf and Racquet Club is your base for a beautiful tropical vacation. Close to everything, the resort includes an extensive recreation area featuring tennis courts, a large swimming pool, and a clubhouse. Experience the thrills of deep-sea fishing, surfing, snorkeling, or scuba diving only a 10-minute drive away. If you're ready for golf, a course awaits you just a mile away. If you seek nightlife, clubs featuring live entertainment are a half-mile away. 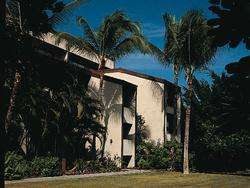 Royal Aloha Vacation Club - Keauhou-Kona Surf and Racquet Club • KKS The resort has a quarter-mile of ocean frontage and is set on a 15-acre resort on the Kona coast. An extensive recreation area includes a clubhouse, swimming pool, and tennis courts. The property borders an 18-hole golf course.